I’ve always found it very odd that Oktoberfest begins in September. Advertisements for Oktoberfest’s always popped up in September and I just assumed they were building some early buzz. To my amazement, they were always around the 20th of September. Here’s why. Back in 1810, Crown Prince Ludwig married Princess Therese of Saxe-Hildurghausen. To commemorate their marriage (on October 12th) a great horse race was organized on October 17th. In 1819, Oktoberfest organizers agreed that the festival would be celebrated each and every year without exception in Bavaria. Later, Oktoberfest was celebrated for a longer period (16 days) and pushed forward to September so that the weather would be better. Festival organizers figured that the hotter the weather, the more beer people would drink. Over the years, the festival showed new innovations. In 1880, electric light illuminated more than 400 booths and tents. In 1881 the first bratwursts were sold and in 1891 beer was served in glass mugs. The Entry of the Oktoberfest Staff and Breweries takes place on the first Saturday of th e festival and showcases decorated hose teams of the breweries and bands that play in festival tents. The beer served at Oktoberfest is a pale lager and contain a higher alcohol-content than a normal beer. American versions sold maybe a little more malty in flavor. Traditional Oktoberfest food includes sausage, sauerkraut, apple pancakes (also known as Äpfelpfannenkuche) and roast ox tails (gross). 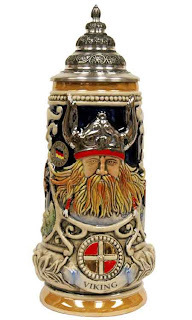 If you ever make it to an Oktoberfest, don’t forget to buy a stein – the must have souvenir. Oktoberfest celebrated its 100th birthday in 1910. 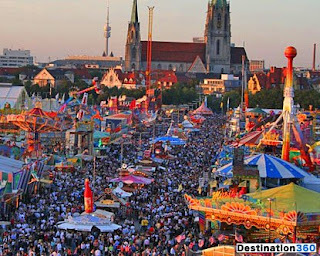 Today, more than 16 million people attend Oktoberfest in Munich and Bavaria. In Pittsburgh, they have a fancy little beer fest at the Penn Brewery that Sprys, Steve and I once attended. It would have been more fun if we were drunker and with more friends, but it was still an experience. When visiting Brady once in Denver, I saw some good ads for an Oktoberfest in Denver. I bet that would have been fab since Denver is one of the big beer cities (home of Coors Light). Look for Oktoberfests to begin this week and run through the first weekend in October. Cheers!